Nissan Versa is a fuel-efficient manoeuvrable subcompact. Despite its size, it offers plenty of space with decent leg- and headroom for both front and rear passengers. The Versa is well presented on the used car market. Is it a good car to buy used? Let's have a closer look. The Versa comes as a sedan or hatchback. 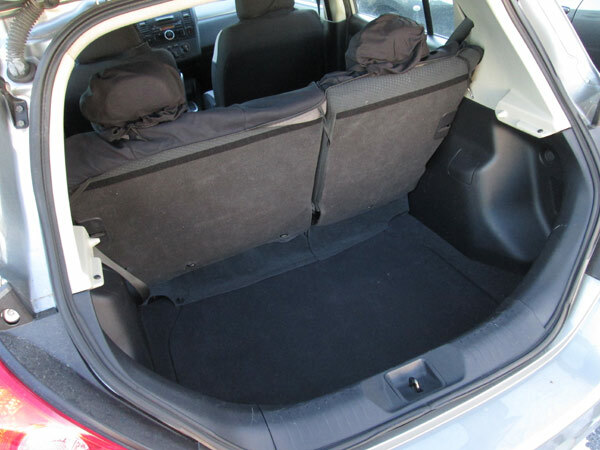 In a hatchback, the rear setbacks fold down, although not flat with the floor. The steering tilts, but doesn't telescope. Seats are comfortable and tall windows offer good visibility. Cruise control, steering audio controls and Bluetooth are among available options. In other markets this car is sold as Nissan Tiida. Problems: A faulty fuel pressure regulator can cause a long crank or no-start condition. Another often-mentioned culprit of the no-start condition is a failed fuel pump. A rusted out muffler flange or mid-exhaust pipe, rattling heat shields and other exhaust problems are common. In models with the Tire Pressure Monitor System (TPMS), tire sensors often go bad. The rear defroster may stop working due to a bad control module. The whole module needs to be replaced. It's quite expensive, but some owners opt for a used part bought from a junk yard. This tread provides some details. Problems with a fuel release cable are mentioned by several owners. A faulty air/fuel ratio sensor or stuck EVAP canister vent control valve are common reasons for the Check Engine light coming on. Suspension repairs (struts, shock absorbers, control arms, coil springs) are often reported. There was a recall for broken front coil springs. A failed passenger front door lock assembly can cause the trunk lock to stop working. If your blower fan is working only at a high speed, it might be due to a bad blower motor resistor. Handling and ride: You won't be disappointed with the way the Versa drives, but you wouldn't call it "sporty". The engine pulls lively and the suspension absorbs road bumps well, but the electric power steering lacks road feedback. Fuel economy: The 2009-2011 Versa with a 1.8L engine and a continuously variable (CVT) transmission is rated at 28 MPG city, 34 MPG highway (8.4/6.9 liters per 100 km). However, the most widely available model on the used car market is the 1.8L 4-speed automatic. It's rated at 24/32 MPG. This means, with mixed city/highway driving, you can get close to 360 miles (580 km) to a tank (13.2 US gallons or 50 liters). Safety: Antilock brakes (ABS) are optional, which means when shopping for a used Nissan Versa, models without ABS should be avoided. Electronic stability control is available only on 2011 Versa as an option. 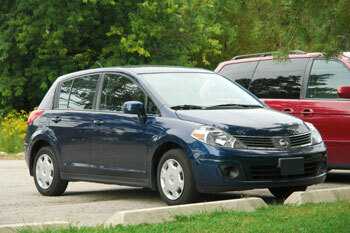 Safety ratings are not bad: the NHTSA safety ratings for the 2007-2010 Versa vary between four and five stars. 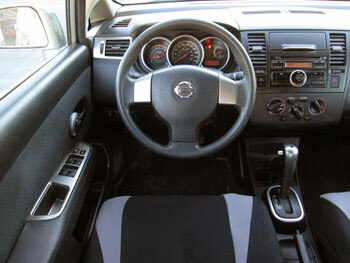 Engines: The 2007-2011 Versa comes with a 1.6L (HR16DE) or 1.8L (MR18DE) engine. Both are double-overhead cam (DOHC) motors with a timing chain. Unlike a timing belt, a timing chain doesn't need to be replaced in regular intervals. Overall: Nissan Versa is a simple fuel efficient commuter. The 1.8L CVT model is the most fuel efficient. A CVT transmission might be a deal breaker for some used car buyers. Read more: Pros and cons of buying a car with a CVT and Is a CVT transmission reliable. A 4-speed automatic is a better choice in our view. The interior space is plus. What to look for in a used Nissan Versa: In addition to the common problems mentioned above a few owners reported that the engine may produce a piston slap. It's a loud clapping noise that is pronounced when the engine is started cold. Used cars that produce this type of noise should be avoided. We also recommend avoiding trim levels that don't have the antilock brakes (ABS); it's a must-have option. How expensive is the maintenance? Nissan recommends changing oil every 3,750 miles or 5,000 kilometers. The Versa requires the 5W-30 mineral oil which is not very expensive. Tire rotation is recommended every 7,500 miles or every second oil change. Once a year or every 15,000 miles, the air filter ( $35-$50 part and labor) and cabin filter ($55-$80 part and labor) needs to be replaced. A drive belt is usually changed every 30,000-45,000 miles ($90-$160 part and labor). At 105K miles, the spark plugs need to be replaced ($160-$225). The transmission fluid needs to be checked regularly and changed if dirty. Usually it's done every 30,000-60,000 miles. Transmission fluid replacement may cost $160-$250. Overall, the regular maintenance is not very expensive. This forum offers a few DIY repair guides.